This afternoon a group of Palestine solidarity protesters entered the main UK warehouse of Israeli company Carmel Agrexco in Uxbridge, Middlesex. 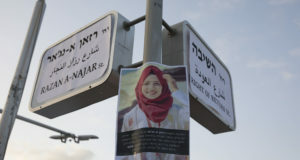 Their action is part of the growing movement to boycott Israeli apartheid, which aims to end Israel’s breach of International law and abuse of human rights in the occupied territories of Palestine. Nine protesters went inside the warehouse, handed leaflets to the workers to explain the reasons for their actions. Two have locked themselves to equipment with D locks. 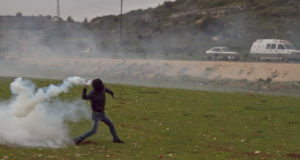 They asked to speak to workers about Carmel Agrexco’s support for ethnic cleansing and war crimes in Palestine, but were met with violence and aggression. Another group hoisted a Palestinian flag up the pole at the front of the depot to symbolically establish a Palestinian solidarity settlement on Carmel Agrexco’s land. Their aim was to highlight the illegality of Israeli settlements that have been established throughout the West Bank on land stolen from Palestinians. This was particularly fitting, given that much of Carmel Agrexco’s fruit, vegetables, flowers, herbs and other produce is grown and packed on these illegal Israeli settlements. Carmel Agrexco is thus complicit in war crimes under the International Criminal Court Act 2001 (ICC Act). 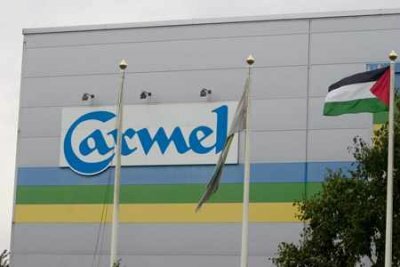 Carmel Agrexco is Israel’s largest importer of agricultural produce into the European Union and is 50% Israeli state owned. The warehouse is in Swallowfield Way, Hayes, Middlesex, at their main depot in the UK. Many of the protesters have visited Palestine and witnessed at first hand the suffering of Palestinians under Israeli military occupation. They have seen land that has been claimed by illegal Israeli settlements, but was stolen from Palestinian families. They have visited villages where the whole community have been issued with demolition orders by the Israeli Army to make way for more illegal settlements. The action today is part of three years of action against the company. Palestine solidarity protesters have taken part in five blockades of the premises, the first in November 2004. Before the protest a legal warning letter was sent to Carmel Agrexco stating clearly why they are in breach of the law. Today’s action aims to draw attention to this company’s complicity, in murder, theft and damage of occupied land, collective punishment, apartheid and ethnic cleansing, and other breaches of International Law. 2. On 9th June 2005 a coalition of Palestinian Civil Society Organisations issued a ‘Call for Boycott, Divestment and Sanctions against Israel until it complies with International Law’. See http://www.stopthewall.org/downloads/pdf/BDSEnglish.pdf for the full statement and signatories. 3. Israel occupied the West Bank, Gaza Strip and Golan Heights in 1967 in contravention of international law. Since then Israel has moved over 380,000 settlers into these occupied territories in contravention of the Fourth Geneva Convention (article 49), the Hague Regulations and United Nations Security Council Resolutions. Israel continues to build an illegal apartheid wall inside the West Bank despite the Advisory Ruling of the International Court of Justice in 2005 that the wall is illegal. Fifty five illegal Israeli settlements will be on the Israeli side of the wall separated from the West Bank. 4,058 Palestinians have been killed as a direct result of Israeli military actions during the current uprising which began in September 2000.